U.S.C.G. 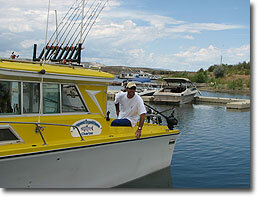 Captain Kyle Edwards is an easy going captain and is well versed in the fishing service industry. Captain Kyle Edwards has a strong reputation for his fishing capabilities as well as his knowledge of the lake and ability to converse on fishing information. He has always had a passion for fishing and teaching people to fish, a passion that is obvious in the quality of his service. Due to the level of service and pride for the company Conquest Expeditions has enjoyed many years of repeat business. Come and experience the fun of fishing and let Kyle take you out for the best guided trip with the best guide service available at Flaming Gorge.